Happy ‘ammer.3 points will do me.Oh and your marks stink worse than usual…. how can Noble get the same as Ayew ffs? How can Noble get 3 and Kouyate gets 5? Are those glasses anti-Noble tinted or is it just you? I thought Noble had quite a creditable game compared to the general standard on show. Surely you know it’s always Nobles fault by now. When we lose its Nobles fault. When we pass the ball back is Nobles fault. When the opposition has more possession but do nothing with it like today, it’s obviously Nobles fault. An easy target for everyone on this site. I thought he didn’t play particularly well today, but worse than Ayew and Antonio? No chance. Noble was miles better than Ayew and not noticeably worse than the others started, except Zabaletta.Antonio did not look ready to start and the two week break will help him recover. Antonio and Kouyate didn’t look fit to me today. Masuaku has to start. Even if it’s midfield; his running and crossing is exceptional. Two weeks to get them fitter and Lanzini back. It will get better I’m sure. What game were you watching? A clean sheet and the goalkeeper gets a 4 and the defenders 5? I’m not saying it was a game for the purist but surely a defence’s job is to defend, which they did. Agreed. Although today wasn’t great, we have one defeat in our last 5 games with 4 clean sheets. That certainly a step in the right direction from where we were after the Newcastle game. Noble was terrible as was the rest of the team the only player who give it was zab .. worse display this season. Good job Swansea were crap or we would have w been spanked. I hold Ayew responsible for the poor performance of Carroll and Hernandez. Ayew had a lot of the ball but his distribution to the strikers was absolutely dire. Was he as bad as that playing for Swansea? Noble was hardly inspirational but he was no worse than most today. Zabaleta played liked a lion among pussycats. Surely man of match. Sakho scored a proper striker goal – good movement and taken with aplomb. Masuaku has been our most effective player at wide left – as long as you don’t need him to defend. I would give Bilic a 2, could he not see that Antonio was nowhere near fit, also did he not remember how well Masuka did last week when he came on?, Bilic should of brought him on much earlier. to be fair the whole team were below par today no one desrved to be scored more than 4 or 5 Bilic sees what they can do in training and they have let him down today. and for those who say Noble doesn’t deserve to be slated he lost the ball 8 times today and didn’t once try to get the ball back, thats unacceptable. time to drop a division and leave with some credibility. Noble was asked to do a job, and did okay. The victory masked what was another frustrating, disappointing display by a team that appears to have lost its mojo. Simple passes were missed. Very little one-touch or confidence to play the ball forward. 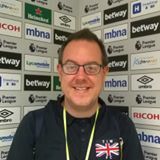 Ayew was atrocious – it feels like Bilic his hoping he’ll come good, given the money we spent on him, but the money is irrelevant – we need to play the players in form. I must’ve missed why Arnie was unavailable today, but I would always play him over Ayew. Judging on recent performances, I’d play Masuaku ahead of him, or give the likes of Samuelson some game time. Felt very sorry for Carroll and Hernandez – the service was toilet, so as a striker, you’re going to come back looking for the ball, making you less effective upfront. Hart – Zab – Fonte – Reid – Masuaku – Antonio, Kouyate, Lanzini, Arnie, Carroll, Hernandez. None of those players are that bad the common denominator is Bilic! He could spend his whole career on a sacking threat all he ever does is buy time in small instalments whilst we have to watch some of the worst football in the Premier League..i don’t believe the players respect him as a manager and why should they?! It was an absolutely shocking performance I was in BM upper and atmosphere was indifferent it had 0 0 all over if I think it was 60 minutes in the first time we put more than 4 passes together, how the hell Carroll got motm was beyond me Sakho did more in 15 mins than the rest of the team the whole match, you mark Hernandez down but Bilic isn’t playing him as a striker ffs Carroll the donkey should have gone off everyone I know wants to see Sakho and Hernandez as a partnership why the hell doesn’t Bilic play them together, Sakho saved Bilic job today for 89 mins and 40 seconds we were hopeless. The moment Noble went off the ball moved around with more pace, I am not singling him out btw the whole team bar prfhaps Zab looked aimless and unfit a common theme under Bilic, for me irrespective of the result he should go even if Sullivan himself managed us he could drum up more intensity than the lame dog we have on the touch line at the moment. Get rid we were lucky to beat the second worst team in the league and i will be very surprised if we survive relegation if we play like that the rest of the season. watching Man U v Palace. Palace may have been spanked but they played more good football in 10 minutes than we did in 90. I agree with an earlier comment. There is a common factor in what is going on at our club. Bilic!!!. We look to be one of the least fit sides in the PL. Nearly all our main players have seriously lost form and are devoid of any confidence. Cresswell for example is nowhere near the player of 18 months ago. Ayew is absolutely useless and should not be near the bench let alone the team. Kayoute is a shadow of his old self. Carroll does not look like scoring. I have been screaming for Sakho and Masuaku to be given a start but no chance. I only hope that the owners have seen enough like most of us. Bilic must go now! These constant attacks on Noble are getting to be like a vendetta, wonder who.is driving these attacks? I have followed the Hammers since I wad 6 nearly 55 years, this is beginning not to be the club that means the world to me, armchair warriors. I have backed C&A for many years, wonder if it is time to get out now! these are not once again ratings that reflect the game I watched, more of an agenda. How sad in sport. There were other players worse than Noble, but they simply are left free, lol I really wonder why! Believe it or not sch! I was not going to post . The teams performance and Nobles contribution was there for all to see and then I saw the post citing a conspiracy theory . When I stopped laughing ( surely it was tongue in cheek ? ) I started to wonder what the small band of Noble defenders are seeing that we aren’t ??? It is without doubt impossible for him to get worse than this . Ball given away time after time , no attempt to win it back and the funniest miskick I have seen for 20 years …. You might only be half of me bubs but you are spot on again … Bye bye captain your time is up . When you return to earth you might see that Nobles pass completion ratio yesterday was 99%, and he passed the ball 30% more times than Kouyate. I wonder what game you were watching. Kouyate should have been taken off. The improvement came with Lanzini, Masuaku and Sahko coming on, not Noble going off. I THINK YOU SHOULD GO BACK TO SLEEP . HAVE A LOOK AT ALL OF THE PLAYER RATINGS POSTS AND ALL GIVE CAPT SLOW THE WORSE MARK . HOW ABOUT A STAT FOR TIMES BALL GIVEN AWAY OR TRACKING BACK TO RECOVER BALL … i KNOW WHAT IT IS 0%… BALL GIVEN AWAY …. 75%…. MISS KICKS …100% … AWFUL , TERRIBLE ,RUBBISH AND YOU CAN ADD CARROLL CRESSWELL AND AYEW TO THAT STAT . TIME TO HANG UP YOUR ANORAK AND WATCH THE GAME BEFORE YOU NOD OF. Ha ha ha That says more about the ‘ player raters ‘ than anyone else. Your stats come from dingly dell. Try looking at the Official website for those same stats. Compare Nobles stats with Kouyates. You will see just how wrong you are. 100%. I don’t need them because I watch the games, but you obviously do need them. It is unbelieivable that you watch games and think Kouyate is worse than Noble . Not sure if it is a wind up or you are just a moron ? I’ve got to agree, Nobes was poor again, as was AC, Cressie and Ayew.(again). Whoever gave AC man of the match is clearly not of this world. Time for pace, with Antonio and Anoutivic wide and Chic and Sakho up front (can’t stand Sakho as a person but ….). And bring back Arthur, the only player who is fit that can run forward with the ball. Bottom line out of the starting 11, 10 of them were below par performances, it was a non event as a match, two relegation rivals playing out a bore draw until the substitutions, I am happy we were lucky and got the goal but I would rather not watch another 2/3’s of a season of that if there is any way out. I cannot see Bilic contract being renewed this season even if we did finish in the European places, the fact is we are a worse performing team now than we were after his first transfer window and that as most know in my opinion is down to poor coaching not the quality of the players he has, not that my opinion means anything and the optimists see it another way and good luck to them (in the nicest sense), for me if we are not going to renew his contract the eprformances will probably fall off a cliff as the season goes on and the players feel he won’t be managing them next season which could be devastating to us if we are short of points.